Construction of prototypes for President Trump’s Mexico border wall will be completed by September in San Diego, U.S. Customs and Border Protection said Tuesday at a press conference in Washington. D.C.
Four to eight 30-foot tall prototypes at the U.S. Mexican border will take 30 days to build, said Ronald Vitiello, acting deputy commissioner of Customs and Border Protection. Vitiello confirmed contracts had not been awarded to build prototypes yet. While money for a full wall along the 1,900-mile Mexican border has not been approved, Congress did allocate $20 million for prototypes that attracted hundreds of bidders from across the country. Construction on the prototypes, originally set to begin in June, will take place near Otay Mesa. Vitiello did not say what caused the delay or when contracts would be awarded. At the press conference, Vitiello repeatedly used San Diego as an example of why a border wall was needed. 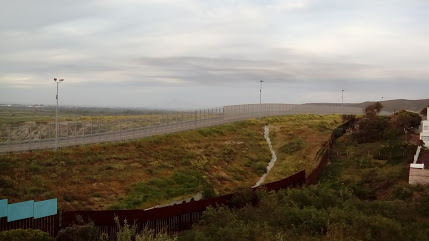 He showed a photo of the San Diego border before and after fencing was added in Operation Gatekeeper in the early 1990s. Vitiello said having a secure border helps reduce crime rates and help improve natural habitats in the area. In San Diego, he said an increase in officers and additional border barriers led to a 195 percent reduction in apprehensions from 1992 to 2008. Critics have pointed to migrants just moving further east to more dangerous crossings. San Diego had a more than 20 percent increase in both apprehensions by Border Patrol and in deportations and returns by Immigration and Customs Enforcement between 2015 and 2016, the Department of Homeland Security said in January. The president has been pushing for solar panels on the border wall in recent weeks, but Vitiello said that did not affect its prototype selection process. He said he was unaware of any discussions between the agency and the White House concerning solar panels on the wall. American Oversight — a left-leaning watchdog group in Washington, D.C., that has sued the federal government for more information on the border wall — said Tuesday the press conference did not go far enough. “As the administration moves forward with the wall’s construction, major questions remain, from its cost, to its environmental impact and how it will affect homeowners along the border,” the organization said in an emailed statement. Sticking with past statements by Border Protection, Vitiello said prototypes could stay up in San Diego after construction to act as new barriers. The $20 million to pay for the prototypes was taken from money in the budget originally set aside for mobile video surveillance used by Customs and Border Protection, said the Democratic staff of the U.S. Senate Committee on Homeland Security & Government Affairs. Prototypes must be 30 feet tall, can’t be climbed and constructed to prevent digging below the wall for at least 6 feet. Roughly 460 companies replied to requests for proposals to build the wall prototypes, including 23 in San Diego County. Vitiello said the agency had already decided some areas of the border, around 130 miles, would not require a wall for geographic reasons, such as rivers and mountain ranges.